Here are some resources to help you as an affiliate of NiftyGridZPro. Please copy images to your own storage to use. Don’t link to them here, that’s a no-no. To get a copy, just drag the image to your desktop and then upload to your own publicly available storage area for linking to. The main ‘product box’ logo. Note that NiftyGridZPro is a digital download so there’s no actual product box! An animation giving the benefits and features. 3 sizes. This is what E-junkie call your affiliate link to our buy page. Get yours from your E-Junkie account as it’ll automatically use your affiliate code. You place the html or link your given on your page / social media. As soon as someone clicks your link, they get your 6-month cookie set in their browser. The link will take your visitor here. Please see the FAQ section for videos you can use. Non-Zazzlers – people who want to or are already monetizing their websites / blogs. If they already have an established following earnings will come in faster. Zazzlers – designers with their own stores. They’ll need to have good product inventory with lots of designs on a variety of products – or want to affiliate other artists / brands work. Below you’ll find some example texts aimed at each group. Obviously everyone can’t use the same text, as that would be bad for your and their SEO. So rephrase, juggle the words around, read the words then write your own. Do whatever it takes to make them uniquely yours. Best of all, once you’ve been succesfully using NiftyGridZPro yourself for a while, you’ll be able to focus on different aspects of its great benefits and features. NiftyGridZPro gives you another way of earning from your WordPress blog by being an affiliate with Zazzle. You focus on writing the all-important content and, when the time is right, use NiftyGridZPro to deal with the finnicky product display and earnings-tracking side of things. Oodles of How-tos, FAQs and vids to help you get from start to expert! NiftyGridZPro gives you another way of earning from your WordPress blog by being an affiliate with Zazzle. You focus on writing the all-important content and, when the time is right, let NiftyGridZPro deal with the product display and earnings-tracking side of things. Easily include multi or single product grids in the flow of your articles – you can even build entire storefronts! Gain more earning opportunities with grid injection for Google ads and other affiliate links. Create promos that are injected into product grids site-wide and in real time! Incredibly powerful broadcast system reaches all your visitors right away. NiftyGridZPro will help you earn from your WordPress blog when you sign up to Zazzle’s affiliate program. You focus on writing that all-important content and, when the circumstances are right, let NiftyGridZPro deal with the product display, doing the earning and tracking referral sales. Use Pages for including as much of a storefront as you want. Use Posts for including multi or single product grids in the flow of your articles. Gain more earning opportunities with grid injection for Google ads and other affiliate links. Oodles of How-tos, FAQs and vids to help you from the ground up! NiftyGridZPro will help you earn from your Zazzle store and WordPress blog. You focus on writing that all-important content, let NiftyGridZPro deal with the product display, earning and tracking side of things. Oodles of How-tos, FAQs and vids because designers like to see examples! 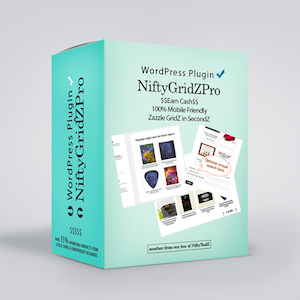 NiftyGridZPro will help you earn from your Zazzle store and self-hosted WordPress blog. You focus on writing that all-important content, let NiftyGridZPro deal with the product display, earning and sales tracking side of things. NiftyGridZPro is a gold-standard WordPresss plugin for Zazzlers that produces pretty, responsive product grids. They can be filtered and sorted using all the Zazzle options – and more, and also has an ad injector (for extra income). The optional, in-built search form helps keep them on your site until they’re ready to buy. What’s more, it’s really easy to use with a straightforward shortcode. Use Pages for including as much of your Zazzle store in a storefront as you want. Use Posts for including multi or single product grids in the flow of your articles. Oodles of How-tos, FAQs and vids because we know most designers like to see examples they can improve on!